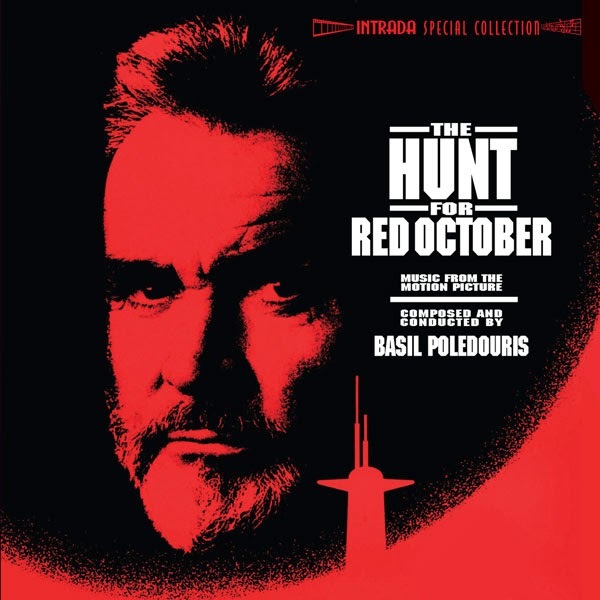 Composer Basil Poledouris was a natural choice to provide the musical accompaniment for Jack Ryan’s memorable first film adventure, The Hunt for Red October. Not only had much of the film been tracked with his music, but the film’s story combined elements that recurred in many of the composer’s projects, including U.S.–Soviet relations (Red Dawn, Amerika), men and machines (Iron Eagle, RoboCop), and the ocean (Big Wednesday, The Blue Lagoon). For the opening titles, Poledouris invented his own "Russian folk" song, one from which the thematic material for the rest of the score is drawn.” Although much of Poledouris’ score consists of short, subdued cues, which mix orchestra and electronics, a few stand-out sequences gave Poledouris the opportunity to bring his full orchestral and choral forces to bear - depicting underwater navigation with a musical sense of wonder, adapting the choral material with a more menacing quality and a lengthy, pivotal sequence in which a a nuclear accident is faked. WOW, JUST WOW... any score collector knows that this has always needed an expanded version from the original release of 30 minutes. This is going to be over 70 minutes! So I say again, Intrada WOW, JUST WOW!